There are two campsites in Marami. The first campsite is big and can easily accommodate more than ten tents. It has an open view of the two rock structures and an unobstructed view of the sunrise as well. Albeit wide and flat, the only bane is that the campsite appears to be a favorite of the resident cows (as evidenced by their droppings). The second campsite is near the summit already. It is small and may comfortably fit only two to three tents. It leaves not much room for activity (in addition to the strong winds and rocky grounds) hence the bigger campsite is recommended. The ascent to the summit is thirty minutes from the first campsite. It commences with a brief trek through a forest which then progresses to a narrow path at the side of the mountains (with grazing cows looking on). Before the final assault, there is a bit of rock climbing prior to a steep grass trail leading to the small summit of Mt Marami. As an added adventure, a group of boulders at the side of Marami’s summit can also be scaled (located at the right side when facing the seas). Take extra caution when going down and over the slippery and sometimes moss-covered rocks. 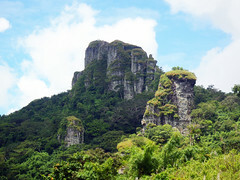 This coming April 11, 2012 po nagbabalak naming umakyat ng Mt. Marami sa Maragondon, Cavite and we’re group of six. In fact we’re not just beginners, we’re first timers. Pwede nyo po ba kaming matulugan through giving some ideas and insights about sa bundok and kung ano pang dapat naming gawin? Thank you so much po sa tulong and I look forward to hearing from you. Sorry po sa abala. Wala po kasi kaming ibang mapagtanungan. Hi Sean, Mt. Marami has open trails. So kapag summer, super mainit; kapag maulan, sobra naman sa putik. Straightforward lang ang trail and banayad ang paahon. Definitely manageable for first-time climbers. As it is all your first time there, best to get a guide. You can secure one after registering at the barangay hall. The campsite is loaded with cow dung. Hopefully when you go there it’s all dried up. Haha.